It is shortly before noon on a Thursday morning in November, and the St Catherine Parish Library (SCPL) is already busy. Upstairs, all seven computer stations are occupied; and the adult reading room is where several young adult students have comfortably spaced themselves across tables, attending to their assignments. Downstairs, the Director of Industrial Relations for the Ministry of Labour and Social Security, Mr Alrick Blake, is delivering a Parents Month presentation to parents who are users of the library, and also teen parents from training centres run by the Phillippo Baptist Church and the NGO Children First. Senior Librarian for the St Catherine Parish Library Network, Miss Paulette Benjie, has much more than the regular running of the library on her mind; she is preparing her staff for the implementation of the Global Library Initiative across their twelve library service points (nine full time branch libraries; two part time libraries and the parish library). 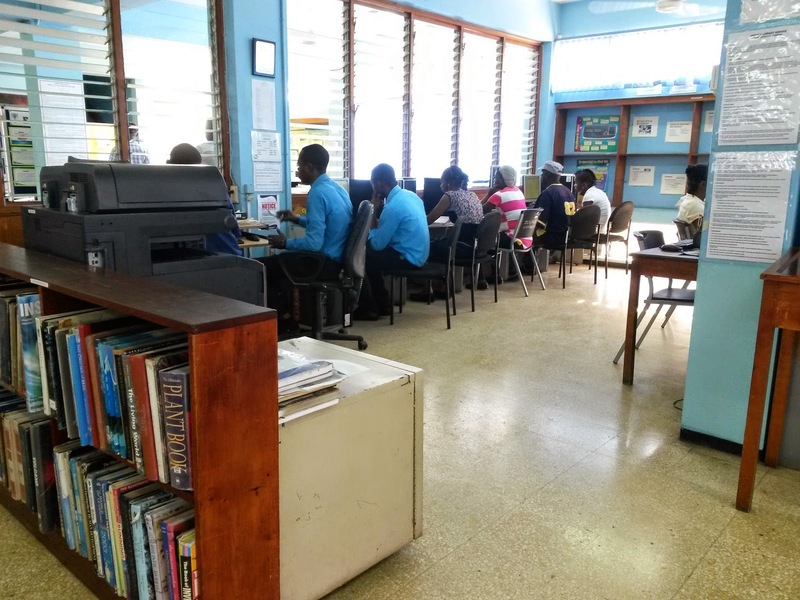 The Jamaica Library Service (JLS) is well advanced in implementing the project across the SCPLN. The needs-assessment survey, done by the Centre for Leadership and Governance at the University of the West Indies, is complete and they are preparing for the installation of 83 computers across the SCPL network. Miss Benjie is careful to say that the expansion in Information and Communication Technology (ICT) services is not just for library users to do research, but is also intended to inspire innovation by users as they access services and gain knowledge. The library is gearing up to provide a "Wow" experience for staff and library users. Already, staff members have completed a Train the Trainer course through the Management Institute for National Development (MIND) to ensure that there is a seamless transfer of skills and knowledge among colleagues, and also to the users. 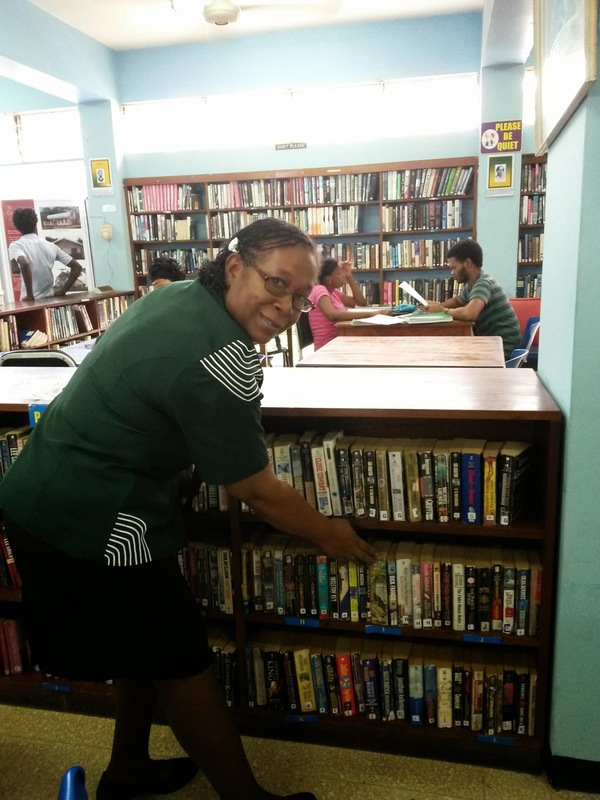 Of the SCPL network, Miss Benjie says that there is a well-stocked reference collection that includes audio visual materials, but the stock needs to be increased and diversified so that supplemental reading material for students, and also reading for pleasure, is covered. Meeting that need is never far from the librarian's mind. "We need a better collection of paperback fiction. Our adult readers like intrigue. Some of the popular authors are James Patterson and Danielle Steele; and in romance they like Sandra Brown, Catherine Coulter and Joanna Lyndsay. They read westerns, mystery, romance and thrilers. Our children will read just about any kind of book that we make available for them, but love mystery stories," Miss Benjie says. Upstairs in the adult section, the section for West Indian books on the shelves showed strong staples in poetry including Derek Walcott's Omeros and Selected Poems; From Our Yard by Pamela Mordecai; Controlling the Silver and Goldengrove New and Selected Poems by Lorna Goodison; and It Was the Singing by Edward Baugh. The prose included memoirs God is Good by Sir Howard Cooke; the series on the Manley family by Rachael Manley; Rural Gumption by a well-known son of St Catherine Dr Herbert Thompson; Cool Runnings and Beyond The Story of the Jamaica Bobsleigh Team by Nelson Christian Stokes; and Growing Out Black Hair and Black Pride in the Swinging Sixties by Barbara Makeda Blake Hanna. Edwidge Danicat's Brother I am Dying was among the other West Indian books. There is lots of heavy material such as Lord Anthony Gifford's The Passionate Advocate; Men at Risk by Errol Miller; and The Search for Solutions by Michael Manley. The parish of St Catherine has nurtured several cricketers for Jamaica and also the West Indies, so it was good to see some books on the sport including Beyond a Boundary by CLR James and the autobiography of Michael Holding, No Holding Back; hopefully Arnold Bertram's Jamaica at the Wicket is a part of the wider SCPL network book stock. The visual appeal in the library is greatest in the junior section which has, of all things, upright piano! 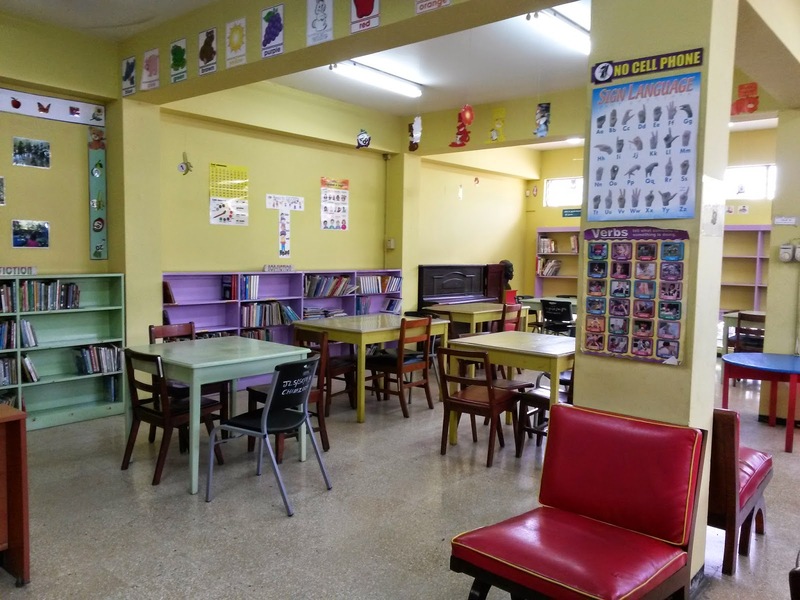 Miss Benjie explained that the room is transformed into an auditorium for their annual One Love concert, that is held in commemoration of the birthday of international reggae superstar Bob Marley; and the Child Month concert that is held on the last Thursday in May. Books on the shelf by West Indians in that section included Jessica by Christine Leo; Handa's Surprise by Eileen Browne; Baker's Dozen and Other Stories by Pamela Hickling; Shaggy Parrot and the Reggae Band by Jana Bent; Pumpkin Belly and Other Stories by Tanya Batson-Savage. A pair of budgies are also there to keep the children company. A cheerful Christmas Tree was already up in the exhibition area near to information boards about diseases Chikungunya and also Ebola. 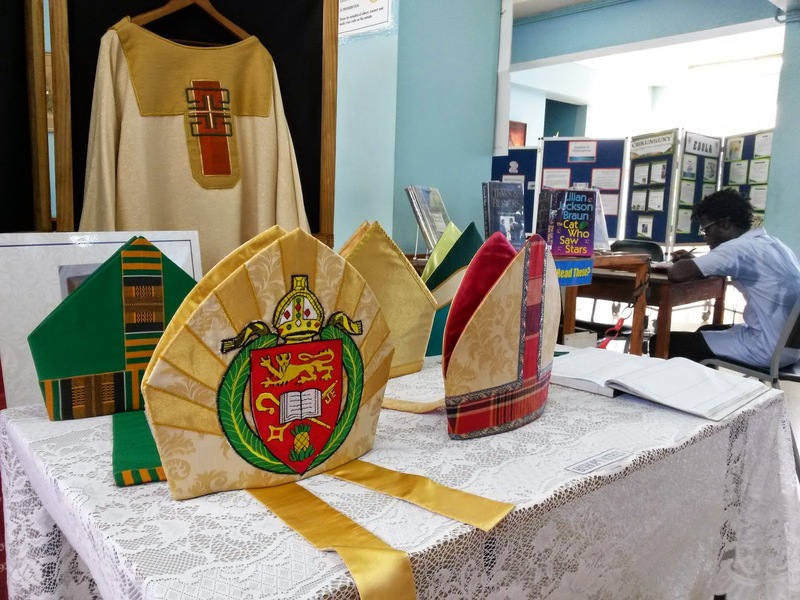 The Diocese of Jamaica currently has a visiting exhibition that celebrates the 300th anniversary of the St Jago church (Spanish Town Cathedral), whose steeple overlooks the library. A feature in the exhibition is a reproduction of a black and white drawing of the church building that was done in the 1700s. 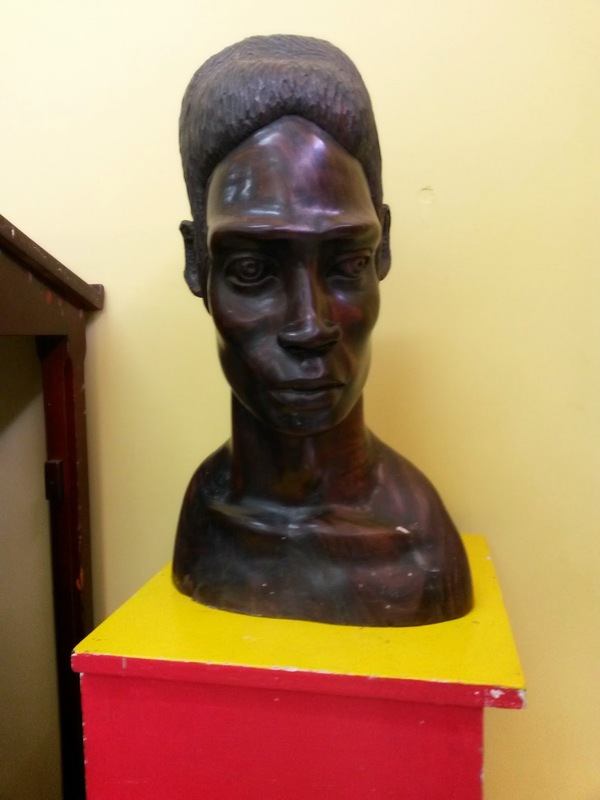 The SCPL was started by public subscription in 1947 in the Old House of Assembly (what is now the parish council building); a year later it came under the management of the Jamaica Library Service, and moved to its current location in 1975. 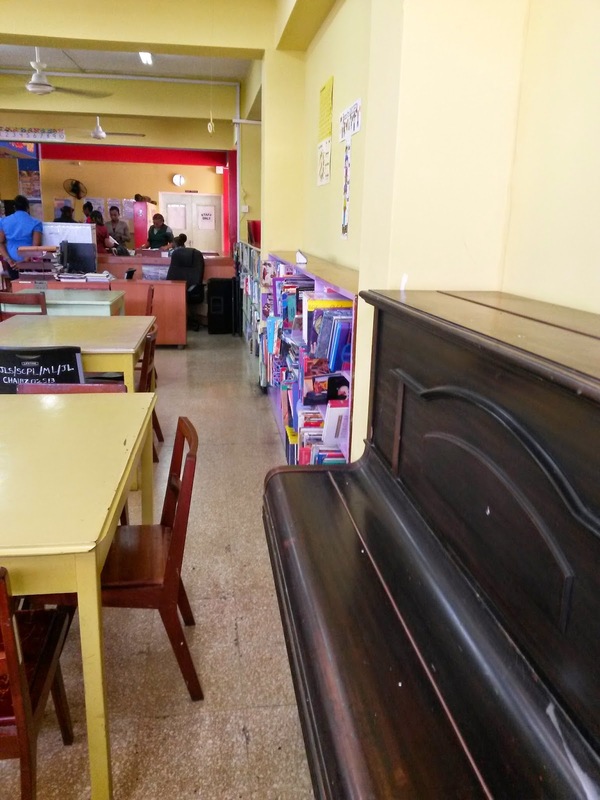 Its annual programme of events includes senior citizen computer classes; a homework programme; a readers and writers club and a Spanish club for primary school age children; weekly reading and storytelling in the children's ward at the Spanish Town Regional Hospital and also to the boys at the Rio Cobre Juvenile facility. Miss Benjie says that the library intended to resume regular visits to serve the inmates living at the three adult correctional facilities that are in the parish. The library is eager to receive donations of recent paperback fiction that meet the guidelines of the JLS, especially books that have about 300 pages. The SCPL library is at 1 Red Church Street with ample enclosed parking. It is open daily from Monday to Friday 9AM - 6PM and 10AM - 5PM on Saturdays. From November to the end of January, the library closes at 5PM. Telephone: 984-2356. Email stcatherinepl@yahoo.co.uk.